Troll dolls, or Dam dolls, were invented in Denmark in the 1950's. A poor woodworker named Thomas Dam carved a troll for his daughter. After that, he began selling trolls in his town. Eventually, his whole family was involved in making these trolls using natural rubber, wood shavings, and sheepskin. They used wool for the hair, and glass for the eyes. As the dolls increased in popularity, the Dam family opened a factory to meet the demand. 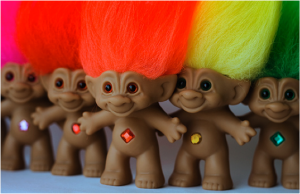 In the U.S., troll dolls had two waves of popularity. The first was in the 1960's when the dolls first hit the market. People across the nation began buying and collecting troll dolls. It is rumored that First Lady "Lady Bird" Johnson owned one herself. In 1963-1965, the dolls were the second most widely sold toys, with Barbie dolls in first place. Many imitations of Dam's original dolls began circulating at this time, due in part to a problem that would not allow Dam to copyright these toys. Over the course of the early 1960s, troll dolls became on of the biggest toy fads to sweep the U.S. In 2003, the Toy Industry Association put troll dolls on their "Century of Toys" list for the year 1961. Then in 1992 troll dolls made a comeback, at which point they were named one of the most popular toys of the year. It was not until 2003 that the U.S. Congress allowed Dam's family to have control over the copyright of these dolls. At that time, they became the one and only manufacturer of troll dolls. 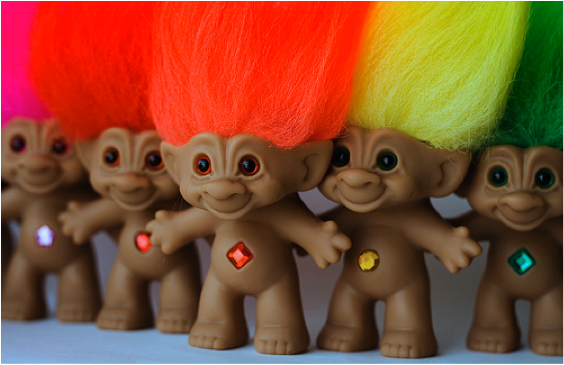 Troll dolls are beloved due to their cute faces and tall, colorful hair. They can be found in a variety of sizes and costumes.